Welcome to Volume 3 of Beginning Kids’ Quest! Using biblical accounts of God’s work in the world to help the children understand God’s character and other abstract theological truths, this volume covers questions 29–46 of First Catechism. Music, games, art, written activities and a lot of repetition reinforce the teaching and help children memorize answers to the questions. Volume 3 is divided into three units of four lessons each. In the first unit, Sin, children learn that sin is disobeying God and that every sin deserves his wrath and curse. God’s wrath is his anger against sin, and his curse is the punishment that we deserve for our sins. In the second unit, The Fall, the children learn that we sin because we are born with sinful hearts. When Adam, our representative in the covenant of life, chose to disobey God, he fell into sin and took the whole world with him. Original sin, which we inherited from Adam, makes us totally unable to know and love God. The third unit, Grace, focuses on God’s plan for saving his people. God sent Jesus Christ to be our new representative. He obeyed God perfectly and then took the punishment we deserve for our sins. Before we can repent and believe in Christ, the Holy Spirit must change our hearts that cannot love God to hearts that want to love and obey him. 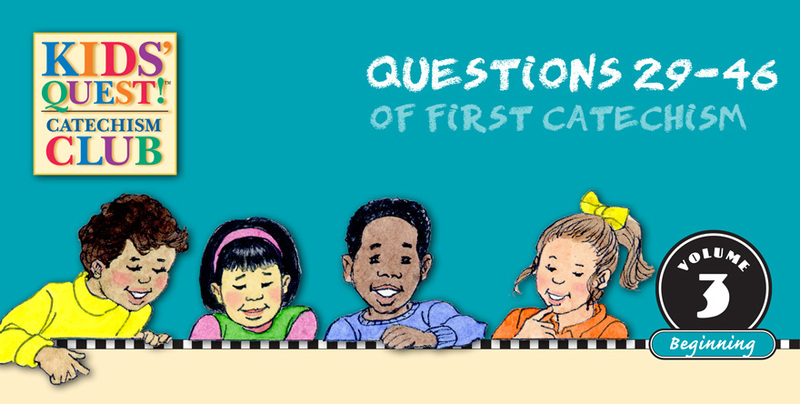 As you begin this final volume of Beginning Kids’ Quest, look ahead to Lesson 12, which celebrates the achievement of memorizing 46 catechism answers. Work with your church’s Kids’ Quest director to plan a celebration that is appropriate for your church. You may decide to invite only the parents, or you may include the teaching and ruling elders, or even the whole congregation. Each child will receive a poster and a certificate (inside week 12 take-home paper), which are included in the Student Activities Pack. Your church may also reward each child with a gift, such as a copy of the Beginning Kids’ Quest CD, which contains the songs used throughout all three volumes. Find out what your church will do and purchase the gifts in plenty of time.